ArcheoPark In itself, the structure of the Fortress of Verrucole catches the eye for its beauty and for the natural environment in which it is placed and charms in every season, inviting you to discover it. Surely, it is one of the most representative monuments of the Garfagnana and the military fortifications on the surrounding area, thanks to its restoration and reconstruction, for twenty years with great success. However, without the intervention of interpreters aware of the Fortress it is likely to be unvoiced, bitter fate that has befallen too many historic buildings, maybe well restored, but basically dumb for any visitors. 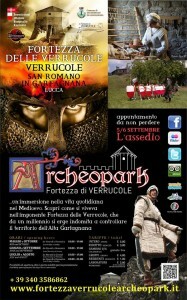 For this reason we have created the project Archeopark Fortress Verrucole. The project Archeopark Fortress Verrucole involves the reconstruction of life inside the fortress as it has been in the past, in the form of Archeopark, in other words a living museum. The arrangement of the rooms as they were from the thirteenth century, the placement of kitchen gardens and animals where they were (chosen philological and respecting the specificities of the territory), the presence of guides-leaders explaining the history and life of the Fortress and Fortress , traditional crafts demonstrations, educational workshops and performances adapted to the context: “Archeopark Fortress Verrucole” is basically this, add value to the structure given by the irreplaceable richness of human presence and passione. Archeopark Fortress Verrucole born as a theme park / living museum, and as such wants to be continuously adapted to the needs of the public and respect for filologicità and protection of Historical heritage. Our perspective is on the way, a starting point for a process based on fundamental tenets: tradition, history, nature, culture, innovation, passion, integrity, quality.